Enjoying a continued rise in popularity in the foodie world, Korean cuisine is packed full of flavour, perfect to sharing and easy to prepare at home. Using simple ingredients, packed with flavour and easy to prepare, Korean Food is getting plenty of well-deserved attention at the moment, with restaurants and home chefs adding Korean flavours and cooking methods to their repertoires. More than just the traditional barbecue, Korean cuisine includes everything from Beef Bulgogi to Bibimbap; and Australian Beef is the perfect hero ingredient to create these dishes at home. Switch up your mid-week meal by adding these deliciously healthy Korean options and enjoy the unique flavours that each recipe has to offer. 1. Thinly slice the beef along the grain then combine with the marinade ingredients in a resealable plastic bag to coat the meat. Return to the fridge and marinate for 2-4 hours, if time permitting leave overnight. 2. Heat oil in a large heavy-based fry pan over medium-high heat. Remove meat from marinade and season lightly. 4. 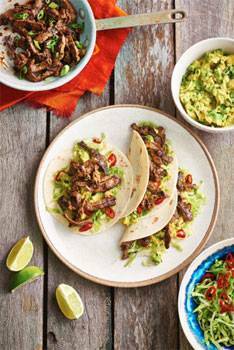 Build tacos to your liking with the beef and remaining ingredients. Visit Australian Beef for more recipe inspiration.